On Saturday, Pope Francis finalised a highly-anticipated teaching document on family issues that has been 18 months in the making. Francis has a reputation for opening the Church’s doors when it comes to concepts of family. The next few weeks may clarify just how far he intends to open them. The document on the family isn’t expected to be released for a few weeks, but pundits, priests, and laypeople will be flipping through furiously as soon as possible to see how Francis proposes bringing more fully into Church life Catholics who are LBGT, divorced-and-remarried, or cohabiting outside marriage. 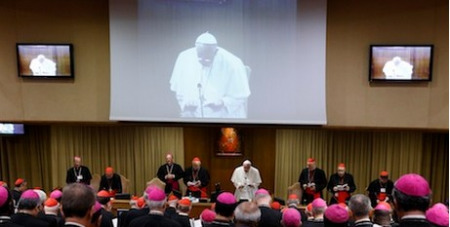 Based on recent hints dropped by the Pope and other top advisers, Church-watchers believe Francis will attempt the papal version of skating’s triple-axle: not changing orthodox doctrine on anything, but altering practice and rules enough to give different types of families new affirmation that they are a legitimate part of the Church. Francis has made many powerful gestures and comments in the three years since he was elected that have made him an icon. But the time and resources he has put into this Apostolic Exhortation on the family is unique, and experts say the standing of his papacy — and its future — may be riding on it. “This the most important test for this pope to show us how he deals with dissent in the Church, how he deals with divided issues,” said Massimo Faggioli, a Church historian who directs the Institute for Catholicism and Citizenship at the University of St Thomas, a Catholic school in St Paul, Minnesota.